WS George collector plate #8 Lone Vanguard from the wild Spirits collection by Thomas Hirata. Limited edition, hand numbered plate was limited to edition of only 150 firing days. 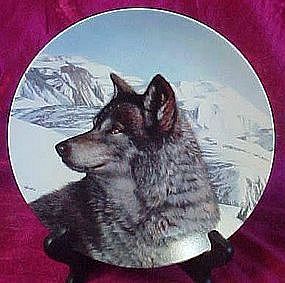 This plate portrays the magnificent black wolf, and he is mysterious and awesome. Plate measures 8 1/4" in diameter and is in, never displayed condition, complete with styro box and certificate of authenticity. I will be listing others from this series.